Artists the world over have long transformed their workspaces into worlds of intrigue, alterity and adventure. Hong Kong’s artists are no different, except that the spaces they operate in are usually a lot more modest in this city of soaring rental prices and ever-shrinking space. One artist whose studio does not suffer from small space, however, is self-proclaimed “cultural fireman” Kacey Wong. 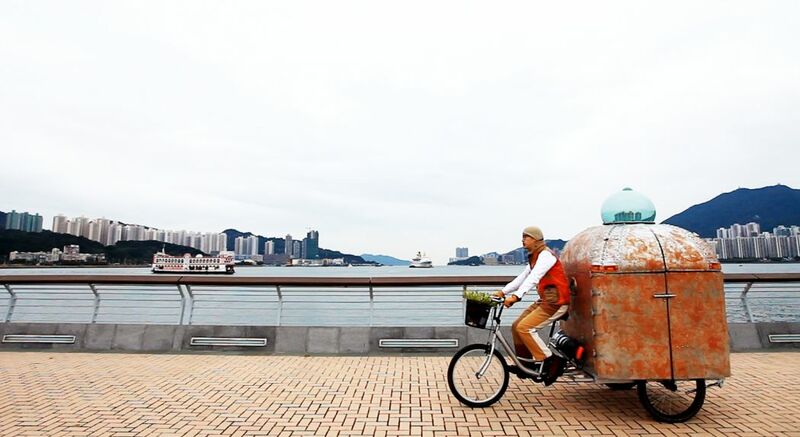 His singular space, which almost feels like entering a film set, spans two levels, and boasts among its many curiosities a spaghetti Western-themed bar, a vast plywood effigy of his Instagram-famous one-eyed cat Ballball, and a big patio complete with tomato plants and a view of the Tin Wan coast. Kacey Wong. Photo: Sarah Karacs/HKFP. For an artist and activist whose work so often broaches dismal subjects — creeping censorial practices, incarcerated dissidents, the June fourth massacre — his studio feels like Hong Kong’s very own epicentre of joy and silliness. There’s a reason for that. “It’s part of my reaction to facing the perception that the future is grim. You think about the song in Life of Brian. ‘Always look on the bright side of life, do do do do do do do do’. You’re on the cross, right? So yeah, I try to maintain a happy life, enjoy my tea, my whisky, the weather, making tomatoes,” he says sitting in a tiny cubbyhole perched above what is otherwise a huge space. Everything about Wong’s studio plays with expectations around the proportions we have of our surroundings. To get there, you first wander down an echoing and rather grim corridor in an industrial building most easily entered through its car park. As you approach his studio, you are greeted by a black door so large as to rather comically outsize all others, and a less than agreeable looking stuffed dog with flashing red eyes. Ring the doorbell, which squeaks out the first line of Beethoven’s Für Elise, and you are granted entry to a space that in one corner features a large screen on which you can play Space Invaders, on another, a human-sized cage Wong takes with him for art performances at protests. “You can stay here all day,” Wong says as he notices you eye his video game machine. This yawning space Wong refers to as his “man cave.” When invited to drink tea, you will follow him up some narrow steps to his cubbyhole, where the ceiling is so low you can’t stand upright. This is his “artist’s cave” – a space separate from the fun and madness of the rest of the place. But bewildering in a more tranquil way. In conversation, Wong is eloquent and expressive. He takes you on emotional roller-coasters that turn from dark to light, silly to morose, hilarious to downright bizarre. The Real Culture Bureau by Kacey Wong. Photo: Kacey Wong. One second, he might be laughing, even giggling, and in another he might be rather stern or gloomy. He has an answer for everything, and uses words like “gotta” and “gonna” that make him sound a bit like a brawler from a James Dean flick. But, reflective of his Ivy League education, he also has a vocabulary that allows him to handle the complex intellectual subjects that so often come up among Hong Kong’s hyper-cerebral art crowd. Not that that world is really his. He is far more likely to be found chatting to art students, photographer friends who accompany him on protests, or renegade political figures. Most recently, many of his friends gathered for a science fiction themed costume party he hosted in the studio, at which dinosaurs danced to retro hits while young Jedis nursed a spaceship-shaped barbecue. 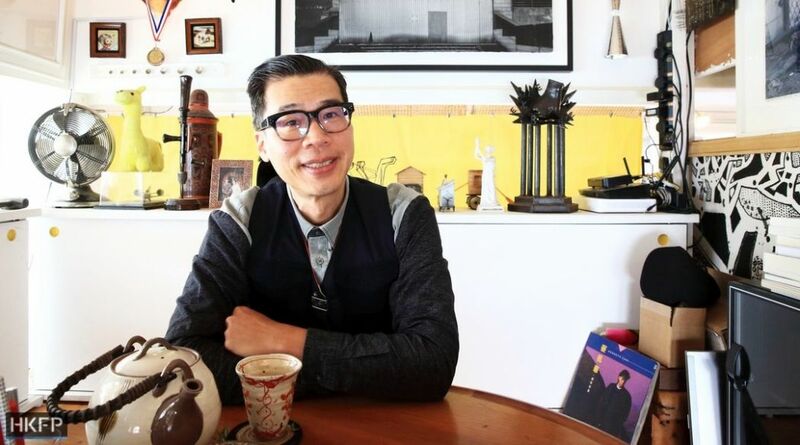 Wong describes himself as Hong Kong’s cultural fireman, which quite accurately describes his role in city life. A Cornell-trained architect turned artist, Wong’s work has turned ever more political since the arrest of mainland Chinese artist Ai Weiwei in 2011. Attack of the Red Giant by Kacey Wong. 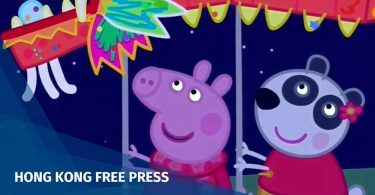 File photo: HKFP, Tom Grundy. Before then, Wong focused on social issues affecting the grassroots, especially on subjects like space and its short supply. His presence at protests came to be felt more and more strongly as the years went by. He is usually accompanied by a fleet of co-performers. One performance that has become legendary in Hong Kong’s creative agit-pop circles involved Wong and others marching silently while holding cut out figures from Picasso’s iconic 1937 work Guernica. “What we are entering, now, is the period of the Banality of Evil,” he says, citing the phrase coined by writer Hannah Arendt in her account of Adolf Eichman’s trial and execution. Indeed, Wong’s literary and cultural influences nod to various historical contexts. One short film he has made that you can watch in his studio draws from Communist songs first written for Eastern European audiences and later translated into Mandarin. Wong translated those lyrics from Mandarin into English, enjoying the optimism of Socialist ideals in the early days of the establishment of Communist states. “Have you watched Netflix?” he asks, in one conversational detour. “Netflix has a lot of these stories: The world is destroyed somehow. Through disease, or world wars or whatever. Or aliens. And you and your lover, or your father, you are both in this sort of no man’s land. And you have to find some truth. Wong is keen on crafting everything by hand – increasingly rare in the contemporary art world, where such labour tends to be outsourced so that artists can quickly churn out new works. He first became especially known for his collection of self-made “mobile homes”. 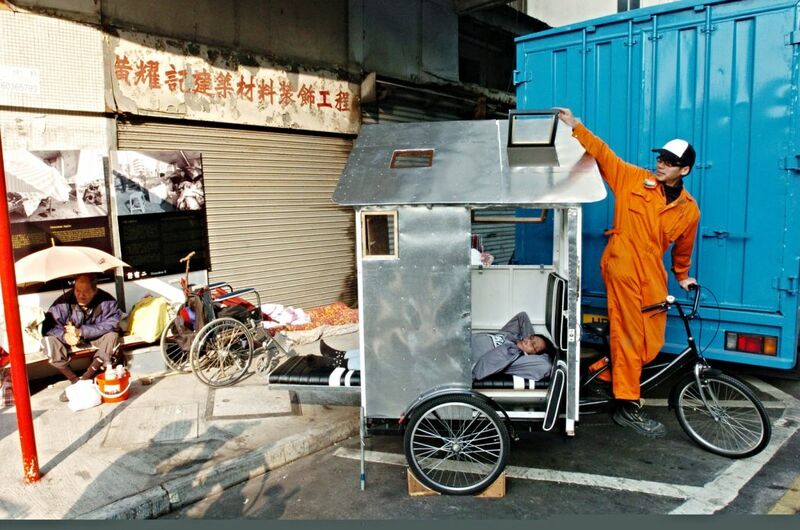 These are a series of tiny cubicles on wheels that he comically hauls around Hong Kong as a comment on a rental market that continues to do ‘more with less’, peddling so-called “micro-flats” as livable homes. Wandering Space by Kacey Wong. Photo: Kacey Wong. 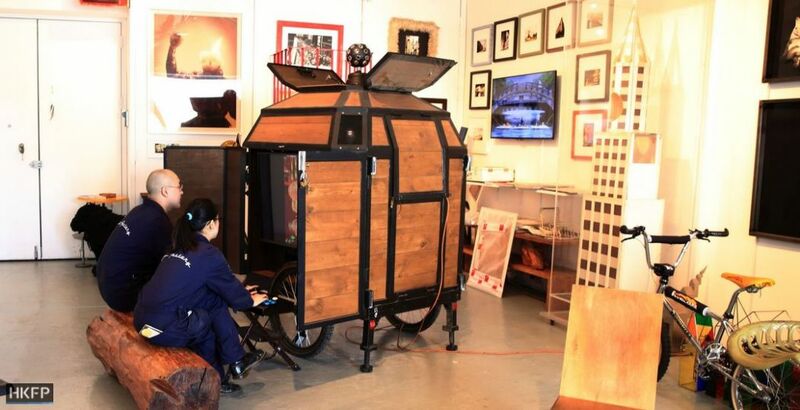 A couple of his mobile homes are parked in his studio. 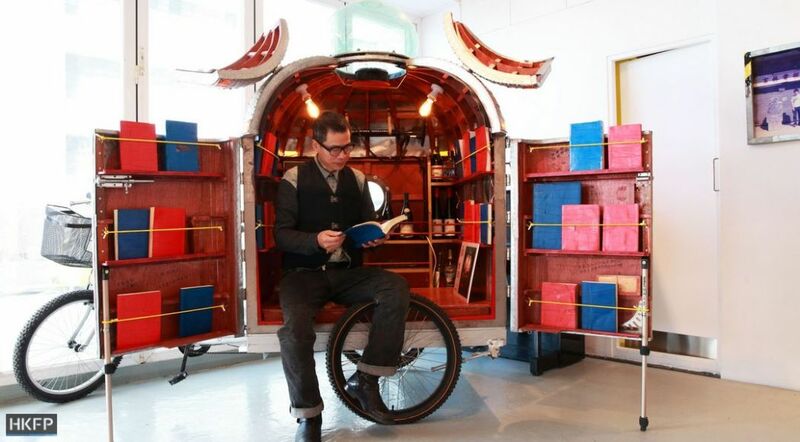 One of them features a mini-bar, another a library of books over which he has pasted blue and red covers. Those in blue represent democratic or Colonial ideals, the red are of Communist stock. The process of choosing what colour Wong wrapped his books in is an intriguing one with a certain irony. “This book is funny,” says Wong, pulling out one with a blue cover. “It’s is called the Foreshadow of History – it is a collection of all the promises of the Communist party. And it’s blue, see? It represents how Communism was supposed to work. But it failed,” he says. 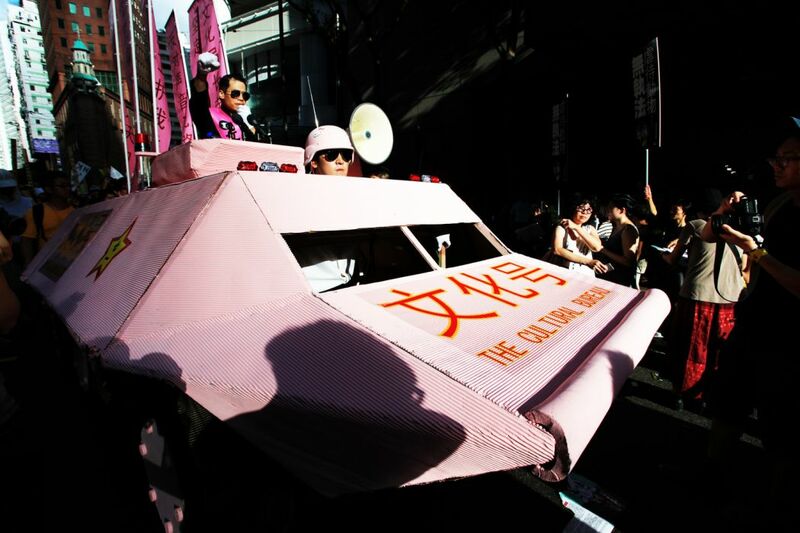 Wong’s political awakening, which intensified with the Umbrella Movement and its aftermath, has coincided with his own effort to explore what it means to be a Hongkonger in the context of mainland China’s creeping cultural and political encroachments, and the remains of British colonialism. Wong took up studies for his own “decolonisation,” a process that involved a lot of reflection on what parts of his cultural heritage he wished to keep and build upon. Having gone through those studies, Wong says he has a lot more clarity on who he is, describing the transformation he underwent as being like a resurrection. “Before it was more like your culture is defined by the passport you hold, or your bloodline, or the language you speak. Now it’s much deeper than that. Such as, how do you identify? It’s based on certain facts and certain imagination. So it’s half fact, half fiction… It’s about pinpointing the self in that chaos of identity,” he says. That pinpointed self has helped Wong manage the feelings of confusion about his Chinese identity that had emerged in the aftermath of the Handover in 1997. On reflection, years later, Wong worked out why this Chineseness felt “shallow” and “fictional” and what it was that reflected who he truly was. 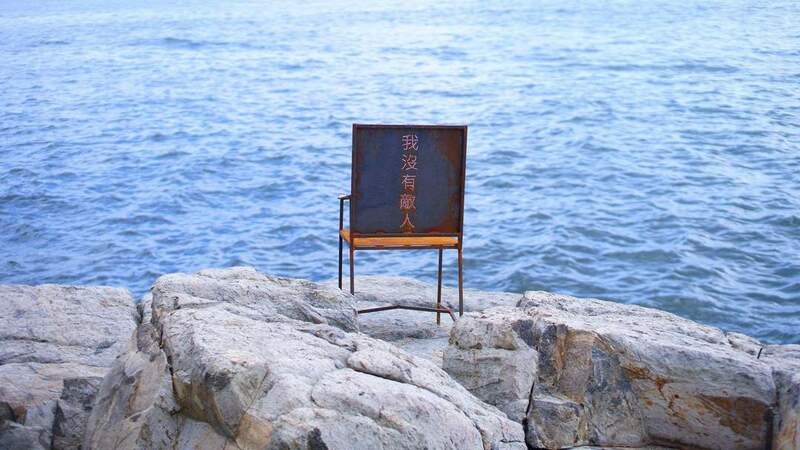 As Wong’s art has grown ever more political – topics he has taken on include a tribute piece to deceased dissident Liu Xiaobo and works on the subject of Taiwanese independence – Hong Kong’s art and culture world is described by some onlookers as moving in the opposite direction. Historically, Hong Kong has enjoyed a rich history of politically-liberated art owing to its status as a haven for free expression. Many ink artists, for example, including the father of modern ink art Liu Shou Kwan, fled to Hong Kong after the Cultural Revolution forced artists to turn their output into propaganda. Here, these artists were able to innovate in a way that defied the impositions of the Communist state, which allowed only art that directly served the Socialist cause. That permissive landscape is changing. This reflects what many see as the increasingly shrinking scope for freedom of expression here, along with the shifting landscape of art economics, which seemingly favours inoffensive “decorative art” geared towards a global market and the growing population of mainland Chinese collectors. Hong Kong artists, already struggling to make ends meet, constantly have to weigh the possible cost of expressing political beliefs in their works. More and more venues are refusing to showcase the works of hypercritical artists like Wong. “Right now we are operating in this ‘no red line’ territory. And that is causing a lot of mental problems for creative people,” says Wong. Umbrella Movement Blind Drawings, 2014. FIle photo: Kacey Wong. Wong is trying to circumvent some of those pressures by showcasing his works in non-governmental and off-grid venues, part of a global movement of artist-activists who take their works and performances out of white cube institutions as a form of resistance against the status quo. This year, as the global, and oppressively glitzy, art market bonanza Art Basel arrives in Hong Kong for its seventh edition, Wong will be showcasing his works at a tiny, independent venue out in Yau Ma Tei. He is also exploring the option of expressing his ideas through an avatar – details of which he does not wish to divulge. Among the creeping incidents of self-censorship, last year’s initial cancellation of novelist and China critic Ma Jian’s talk at Tai Kwun was an event that Wong felt particularly moved to speak out against, even after the site back-pedalled on the move amid a furore. Wong was one of a small group of protesters who held up white signs outside the new art, culture and heritage venue that, alongside West Kowloon Cultural District’s hotly anticipated, long delayed M+ museum, presents itself as a harbinger for Hong Kong’s cultural emergence in an increasingly global art world. Though they had tried to rally a large crowd of artists, many didn’t show up out of fear of compromising their careers, says Wong. “You can’t force people,” he says. Another disheartening experience attached to that protest was a feeling Wong could not shake that he and his peers were being followed by a plain-clothes policeman, something that appears to be happening much more often than in the past. Recalling the experience, Wong inserts his trademark whimsy. “The people who are assigned to this protest rally are usually quite goofy. They’ve got a bad job. Who wants to go to an assignment to monitor some peaceful demonstrators. They are like artists and literature people, what are they gonna do? I dunno, like write some slogans to hurt people? And I gotta spend the whole day looking at them. What the hell? I want some real criminals. Incidents like these, alongside various political developments that have taken place over the last few years — the disqualification of lawmakers, the expulsion of British journalist Victor Mallet, the proposed national anthem bill — give Wong a lot of cause for concern. 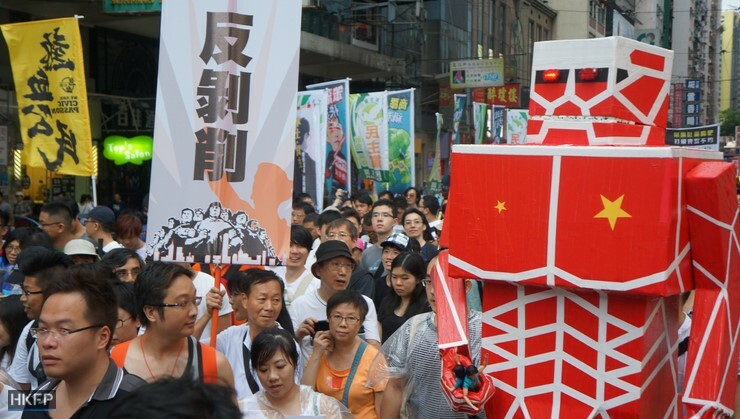 And, to rub salt into the wound, he says it often feels like he’s the only one left scrambling to try and put out the cultural fires sparked by these gloomy harbingers of Hong Kong’s future. Keen on metaphors, Wong offers the image of Hong Kong’s art ecology as being like a beach that is growing more polluted by the day. See also: Hong Kong poet Tammy Ho: Art in politics or politics in art? “When that ecology is shrinking and destroyed, when we talk about the environment, right, the beaches, full of litter. It makes you worry. And its normal to worry, its normal wanting to clean up and fight back. “And of course that’s what I worry about, how I react. Soon we will have no artistic beach to swim at. And I’m not even cleaning up, I’m voicing out. I’m just voicing out: Hey! the beach is dirty,” he says, munching on a homegrown tomato as his video game machine bleeps in the background.